Arvel the Swift is a Dunmer thief who stole an antique golden claw from Riverwood Trader in Riverwood, and then retreated to Bleak Falls Barrow. You will be tasked with recovering the golden claw from him by the owner of Riverwood Trader. 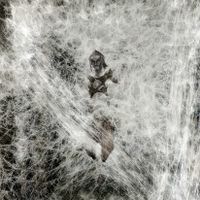 He has become trapped in the web wall located in the room with the wounded frostbite spider. As you approach this room, he can be heard shouting for help: "Hey, over here! ", "Help me! Help!" and "Get me out of here!" As soon as you enter the room, the giant spider descends to the floor. Arvel will panic and shout remarks such as, "Ah, kill it. Kill it! ", "Get it away from me. Get it away! ", "Don't let it get me. Help!" and "Keep it away from me!" Once the spider has been defeated, he will be overjoyed and say one of the following lines: "Is it over? ", "Is it dead?" or "Is it safe now?" As you greet him for the first time, he will thank you and say, "You did it. You killed it. Now cut me down before anything else shows up." Once you talk to him, you may ask him a few questions before freeing him. If you ask about the location of the golden claw, Arvel will avoid giving a direct answer and say, "Yes, the claw. I know how it works. The claw, the markings, the door in the Hall of Stories. I know how they all fit together!" Asking about how the claw works will cause him to promise, "Help me down, and I'll show you. You won't believe the power the Nords have hidden there." If you ask for the claw first, he will become enraged and respond with, "Does it look like I can move? You have to cut me down, first." Once you agree to cut him down, Arvel will understandably be relieved and remark, "Sweet breath of Arkay, thank you." As you begin to cut him down he will say, "It's coming loose. I can feel it." However, once you free him it becomes clear that he has no intention of giving the claw over to you. He will instead run towards the next room and brush you aside with, "Sorry, but I have a treasure to get to...", "So long "friend." Ha ha ha! ", "I'm too swift for you!" or "You fool! Why should I share the treasure with anyone?" Once he reaches the next room full of draugr, he will defend himself, but usually dies. If you save him from the undead, he will be killed by the spike wall trap or the swinging blades trap. If you get too close, he will also turn hostile. Regardless, it is impossible to keep him alive. 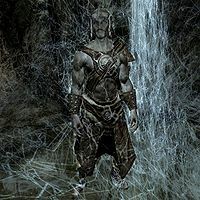 [verification needed — see talk page] You may also kill him as soon as you free him, although low-level players may find him a useful distraction for the draugr in the nearby room. Arvel carries a journal describing how the claw came into his possession. Bandit #1: "So we're just supposed to sit here while Arvel runs off with that golden claw?" Bandit #2: "That dark elf wants to go on ahead, let him. Better than us risking our necks." Bandit #1: "What if Arvel doesn't come back? I want my share from that claw!" Bandit #2: "Just shut it and keep an eye out for trouble." Arvel was featured in pre-release videos of the game. However, a slightly different version of Arvel was shown in those demo videos (BaseID 00099991). If Arvel is kept alive and protected from the various traps he runs through (using Ash Shell and Calm), he'll come to a halt right after the first swinging blade trap. If spoken to, he'll think he's still trapped in the spider's web. This page was last modified on 11 July 2015, at 10:40.